Twitter has had a recent nasty string of outages, technical gaffs. Ouch, poor little blue birdie. While I have taken my cheap shots at them, I am liking pondering why, in the fickle fast pace high expectations web 2.0 days we live in (and knowing the “we” there is perhaps not all that inclusive of the world at large), that people are staying with it? What jumped out at me was the fact that poor db006 (obviously not the database that is shaken, not stirred) is referenced as singular. Reading the comments are plenty of cheap shots like “buy another server dude” or “just hire someone who knows databases”. The one from ‘Phil’ places me in my armchair with a dose of rationality. So it’s not like they are lounging on the beach while db006 is up in smoke. So why don’t the masses mass elsewhere? Part of it is, I am totally guessing, is that twitter is hardly essential to our daily work and lives. Sure, many get very engrossed into the constant connections, but there are plenty of other things to do, or other channels to feed the fix, and since the information size of twitter content is so small, it does not adversely affect our existence. And it is not like we “miss” out on something when it blanks or stumbles. But for me, the reason is, with its outages and times when something is “technically wrong”, twitter still manahes to deliver things useful to me, in a time frame unmatched by any other avenue. And its not really twitter providing it, it is the human cloud doing it. But it also does the magic of provding me information about things I was not even seeking. terraminds searches by keyword tweets from the last 3 months, and its search can, I think, be embedded into your own site. Here is a query on my tweetings… . No RSS or clouds. summize is yet another search twitter tool. It has some links to “trends” and “nifty searches”, but for me, provides an RSS feed, a way to twitter the searech results (holy recursion, Batman). 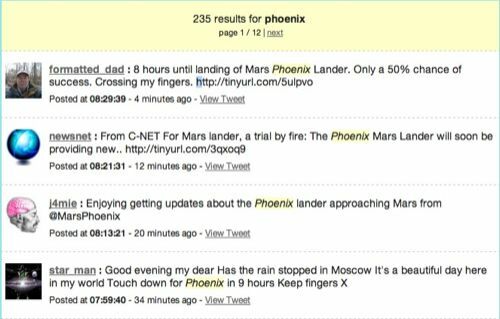 The same cogdog query produces similar results, but not quite back as far in tweet time. Twitscoop was built to help you stay on top of Twitter’s hot topics or discussions. 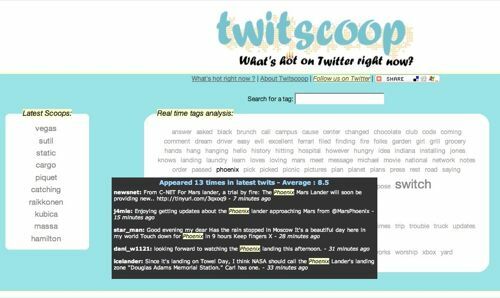 Through an automated algorithm, Twitscoop crawls hundreds of Twits every minute and extracts the words which are mentionned more often than usual. The result is displayed in a Tag Cloud, using the following rule: the hotter, the bigger (no joke here). I almost clicked away. I dont really care to know what is “hot”, like I really dont care all that much to follow the trends, I dont care of Scoble does this or some other “hot” A1er says — I track what people in my own cloud reflect off of that.. This dog does not care where the big crowd goes. But I hover over te “hot” words in the tag cloud, and kind of am intrigued that it shows by pop=up box what the actual tweets where that included the word. So “vegas” is popular… er HOT in tweets– people using that in saying they are going to Las Vegas, referring to TV shows about Vegas, and I bet once every 17 minutes, someone tweets something about “whatever happens in Vegas stays in Vegas”. To me that mixed use of results is a bit of a crap shot whether you will find something useful. Its an interesting mix to see how a word is used in different ways. 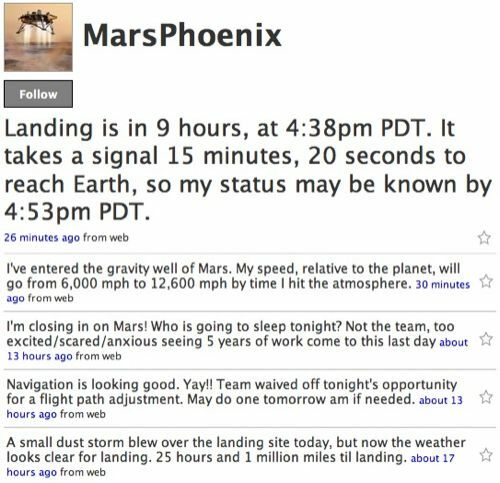 And then someone points that MarsPhoenix has been tweeting his/her entire trip! This is a joyous familiar feeling of falling into something need on the net that I was not expecting. And while this gives me a pump, I scratch my head in wonder if this haphazard approach works for others? I cannot see another way to swim in this sea of information but to be un-expecting, and open to exploring the unknown, and not feeling like I need to know the whole ocean. And I hardly swim alone. Maybe the metaphor is plankton. Nope, that gets into conjecture of whales. Serendipity is my daily high. I put up with Twitter for those serendipitous moments. No where else, not even Pownce or FriendFeed or Facebook, do I find out about things like the Phoenix Mars explorer in real time and in ways that matter to me. No where else can I track this, comment back, and feel like a part of a bigger community in which I am somewhat removed from at times. Twitter keeps me connected in ways nothing else does. There is no ontology for serendipity, and it is what scares me so about the structured web, despite all its possible uses. This is an awesome post, that captures the deep sea discovery of the web beautifully. Your post is very poetic !